This entry was posted in Random Info and tagged award, best, detroit, hell yeah, win. Bookmark the permalink. Wow… Congrats to you on winning this award! 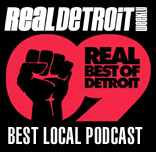 Sure wish I could have a podcast that’s been around for a year and have it win a real detroit award! 😉 Been doing it for over 4 years here in Detroit! Hope you can meet up with us sometime and share your secrets of success – we’re at http://detroitpodcasters.net, been around since 2007 – many of us have been podcasting since 2005! Best of luck to ya!